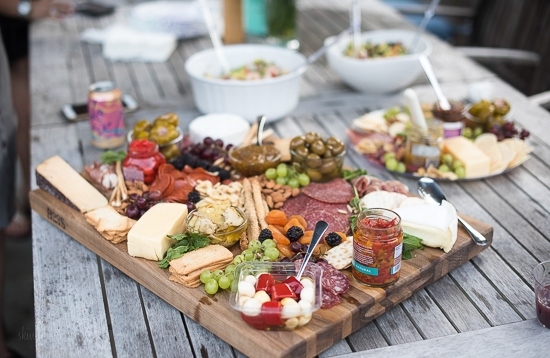 Meat and cheese boards are my go-to for super chill, no stress summer entertaining. You can load them up with all your favorite cheese, cured meats, fruit, nuts and spreads. Add some wine and baguettes and you have yourself a meal! I just returned from a weekend in the Hamptons (more about that soon!) co-hosting a blogger retreat with Lexi of Lexi’s Clean Kitchen and Liz of the Lemon Bowl. We rented a beautiful house in Water Mill and hosted 11 food bloggers plus a photographer (photo directly above is taken by Raul Velasco). Lexi and I made two Charcuterie and Cheese Boards (a gluten-free, allergy-friendly one not pictured here) with lots of hot dips, Sangria, wine, plus avocado shrimp salad, and my Southwestern black bean salad for there arrival. One of our sponsors for the event was Delallo, a brand I work with and LOVE because if you’re familiar with them, they are the BEST! Peapod was also so generous to donate most of the groceries such as the fruit and herbs pictured here. The best part, they both delivered to the Hampton’s house we rented so I was able to place my order online ahead, and have everything there when I arrived. Back to this epic platter! There really is an art to making photo-worthy, mouth-watering platters. Varying the colors and textures, a variety of meat and cheese options, and lots of fresh items is the secret to success. 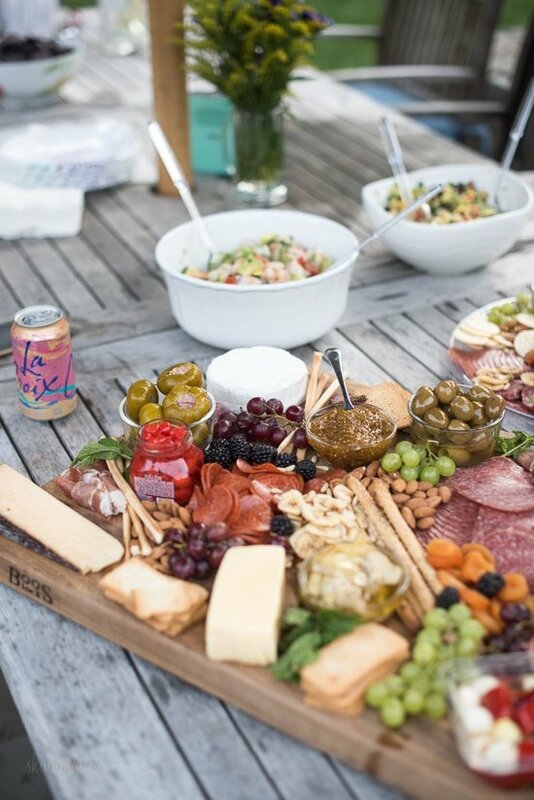 For a smaller crowd, use smaller boards or platters. If you make one this summer, I want to see, please tag @skinnytaste on Instagram and I will regram the prettiest photos! Step 1: Find the right boards to build your platters. Large cutting boards, marble slabs, slate boards or ceramic platters are great options. Step 2: Choose a variety of cured meats and salumi. Pictured here sweet Sopressata, salami, proscuitto, pepperoni, and a variety of other cured meats from Delallo. Step 3: Use a variety of soft and hard cheese options with varying milk types and color such a Brie, Havarti, Gouda, Hot Pepper, Mozzarella, Provolone, Blue Cheese, etc. Step 4: Add some cured olives and colorful antipasti. Pictured here, Delallo Garlic and Pepper Antipasto, Grilled Artichoke Hearts, Green Cherry Pepper Shooters Stuffed with Proscuitto and Provolone and Sweet Tangy Pepper Drops. Step 5: Add a few spreads, jams and mustards with with a variety of crackers and bread sticks. Pictured here is Delallo’s fig spread, and roasted pepper bruschetta. Step 6: Mix in a colorful variety of fresh and dried fruit such as grapes, berries, dried apricots, and dried banana chips. Step 7: Use a variety of nuts, mix them up! Here we used pignoli and almonds. Pistachios, and pecans are also great. Step 8: And for some finishing touches, add some fresh herb sprigs such as mint or rosemary. Delallo has graciously offered a 25% discount site wide to Skinnytaste fans! If you place an order use the code SKINNY25 at checkout. You can also see Lexi’s Guide on building the ultimate cheese plate here. variety of soft and hard cheese options such a Brie, Havarti, Gouda, Mozzarella, Provolone, Blue Cheese, etc. spreads, jams and mustards with with a variety of crackers and bread sticks. Pictured here is Delallo’s fig spread, and roasted pepper bruschetta. Grab a large platter or two, you can use cutting boards, ceramic platters, slate cheese boards, marble slabs, etc. 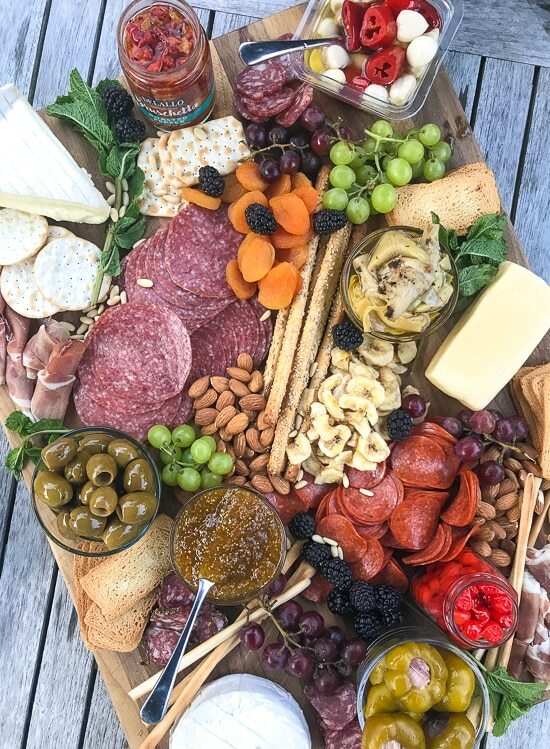 Artfully arrange where you want your cheese selection and jars, bowls of olives, jams, and antipasti to go, then place varieties of meat slices and rolled up meats around. Scatter crackers and bread sticks to fill up space, then add your fruit, nuts, and herbs to make keep the colors balanced and beautiful. 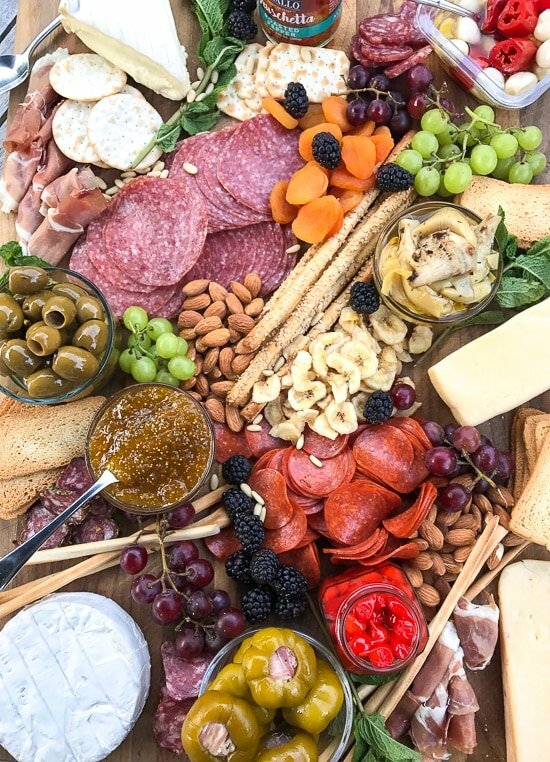 The charcuterie board trend is pretty awesome! I grew up in an old-world Italian household, with three generations under one roof! My Grandmother would make a “charcuterie board” for us an an after school snack as young as when we were in elementary school! Cheeses, meats, Italian bread, Stella D’Oro breadsticks, dried figs (she dried them herself using fresh figs her fig bush), homemade jam, flavored EVOO for dipping the bread or breadsticks and grapes. There were three of us kids (and my Mom and Grandmom would snack with us, too!) so it wasn’t a HUGE board (it was just a snack, after all), but we had it several times a week as a snack and the BIG board was out for the family Sunday dinners which had a lot of other stuff the “kids” didn’t like just yet! Every time I see a pic of one of these it reminds me of my Grandmother and all the great memories I have of her. I miss that woman!!! Those are the best kind of memories! This looks beautiful! I am making this for Thanksgiving! Hi Gina, what about crackers?! That’s always my challenge! Thanks! Love this article! My problem is finding quality cheeses in small quantities. I don’t know of a cheese shop or deli that has “exotic” cheeses they will cut. Am having a “tinto de verano”-summer wine, less time consuming than Sangria party this week-end so will use your suggestions. Salud! I’m loving your board too! And the combination of meats, cheeses, spreads, fruits, etc. here is delectable! 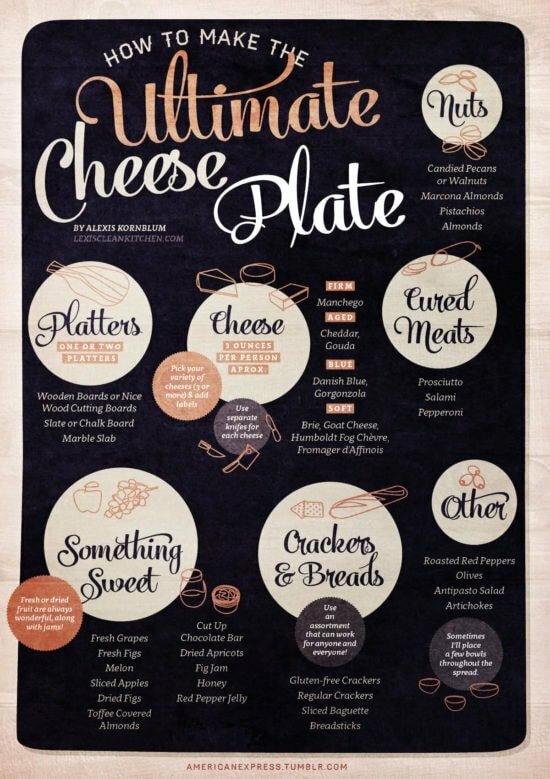 Thanks also for sharing the great visual on how to make the perfect cheese plate. This helps me know how to better organize my boards. Looks delicious, as usual! Quick question: do you have any advice on sliced meats I could offer that aren’t beef or pork? My family and I gave up eating beef and pork a couple of years ago but still eat poultry, fish, etc. and I SO miss putting together charcuterie and cheese boards. Any suggestions would be very much appreciated! I’ve seen boards with chicken jerky, and you could add some sliced turkey ham and turkey pastrami. Smokes salmon would also be a great addition! I think everything jammed onto one board especially with banana chips is too much for our preference. We’re a family of chefs from the CCA (California Culinary Academy in San Francisco with twenty years under our belts) so we’re pretty picky about palate and presentation. You’re recipes are usually great and have helped me be a chef based on my full guilt recipes at work and not guilt recipes at home thanks to you. Always nice for a different perspective when culinary training gets mind set stuck on traditional flavors and expectations. you’re so professional in your presentations usually. Thanks for all you do to inspire us. So glad my recipes can help balance! Feel free to make them to your liking, of course! Fun. But boy, that’s a whole lot on one board! I’m thinking dividing it into 2-3 boards based on items may be prettier and more themed. Just a personal preference for a cleaner appearance. Thanks for the inspiration though. I can’t wait to make this for my next party. Where can I buy the lovely wooden tray shown in the picture. Gina, I enjoy so many of your recipes and food preparations and suggestions. However, these boards featuring charcuterie are loaded with processed and highly salted preserved meats . Some of the lower fat cheeses are more healthful as are any raw veggies — not so much the pickled ones. Eating a few well chosen items from a cheese board is fine for an appetizer, but to make an entire meal out of it is not exactly healthful eating. We subbed out the bread sticks and crackers for gluten-free options. Oh Gina!!! Thank you so much! I am having a family reunion next month and this will be a huge success. Thank you also for the discount code. I just placed my order and saved $28 thanks to you!!! You are amazing! Yay!! Kiss your friends at DeLallo for giving us a coupon code 🙂 🙂 I’m excited! You don’t happen to have a coupon code that isn’t expired, do you? What size is your Boos cutting board? I love this idea and I love charcuterie! Sorry I wish I knew the size. I love it. It’s gorgeous with so many flavors. It also looks like it would be pretty expensive to make. Yes, def for special ocassions. I love cheese and meat boards but I struggle with their high fat and calorie content. Any ways to make this more skinny? They are certainly meant for sharing and picking at, but yes serve up some salads and roasted and raw veggies! This is so helpful! I always have trouble finding the right assortment and this is wonderful! These boards are my favourite because its got everything on it, and you can mix and match what ever you or your party goes like. 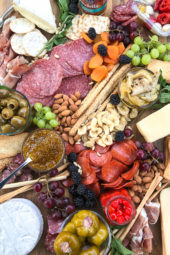 I also love how you can have salty and sweet and meat and cheese at your will, it’s like the best PMS board ever!!! My husband and I are drooling already. Great to have fresh ideas. Hey Gina! I recently started weight watchers and I love using your recipes for it. I love how on your website you show how many points each recipe is per serving. My problem is, I have your cookbook and it doesn’t have the points in them! Is there an easy way to figure out the points?! Thanks!! I love cheese boards. I call them snack plates. Every bite is a different flavor. Mix and match. Love love love them.